The Smith’s entered the world of camelids with a livestock background. We had raised cattle for over twenty five years and became interested in alpacas after our youngest child started college. We visited a nearby alpaca farm and were intrigued. We then looked at several farms and began research to better understand the animals. While vacationing in Colorado, we visited Switzer-Land Alpacas in Estes Park, CO. This is where we were introduced to paco-vicuñas. One look into their big beautiful eyes and our lives changed. In August of 2007 the Smiths purchased five pregnant females. 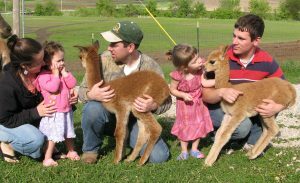 In ten years we have grown our herd to over 200 paco-vicuñas. Don has a career background in business management. Gloria, who has always been a full time homemaker, manages the fiber side of the business and has stepped into the role of paco-vicuna midwife. The website and social media also fall into her job description. Don and Gloria’s oldest son Seth and his wife Ashlee are partners in this enterprise. Their backgrounds in finance and marketing are an asset to our partnership. Their children Abigail, Jacob and Lydia have been “raised in the barn”. We all work together on daily chores, building projects, and routine animal health care and training. Our three other children and their spouses are happy to step in and give us a hand when it comes to shearing and raising rafters. All eleven of our grandchildren make for great photo shoots as they love spending time with the “pacos”.